Matt Eichmann (second from the left), Greif’s vice president of investor relations and corporate communications, presents the keys to a new Meals on Wheels delivery van to (left to right) SourcePoint Director of Client Services Fara Waugh, Nutrition Program Administrator Karen Pillion, Director of Operations Kimberly Clewell, and Development Officer Julie Zdanowicz. The van replaces a 2005 vehicle that had more than 100,000 miles on it and was plagued by several mechanical issues. SourcePoint replaced one of its Meals on Wheels vehicles Friday after Greif, Inc. donated a new van for the program. 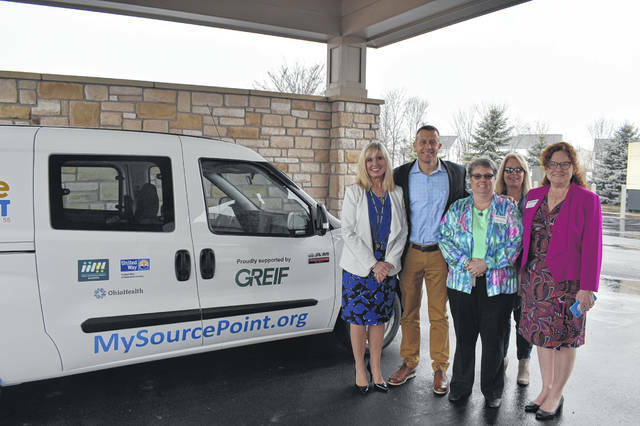 Matt Eichmann, Greif’s vice president of investor relations and corporate communications, visited SourcePoint to officially hand over the keys to the van, which will replaced a 2005 vehicle with more than 107,000 miles and several mechanical issues. “We’re very pleased to be able to help out,” said Eichmann, adding he’s excited to see the van with the Greif logo driving around in the community. “We have three different things we focus on around community engagement: health, wellness and education. SourcePoint and Meals on Wheels squarely fits within a couple of those pillars of philanthropy,” he said. “We’ve been in Delaware since 1951, so we’ve got kind of a local roots focus. “I’m really excited to see how this vehicle looks and the impact it’s going to have on meals. We are helping make (SourcePoint) more effective in how they are partnering with the community. These guys can do it on their own, but if we can help them become more effective, that’s really exciting to me personally and to our company as a whole,” Eichmann added. In 2018, SourcePoint’s Meals on Wheels program grew by 15 percent, with similar growth projected this year, SourcePoint reported Friday. Funding for Meals on Wheels comes from a variety of sources, including the local property tax levy, federal funding through the Older Americans Act, and private donations. To learn more, go to MySourcePoint.org/nutrition. https://www.delgazette.com/wp-content/uploads/sites/40/2019/04/web1_DSC_0241.jpgMatt Eichmann (second from the left), Greif’s vice president of investor relations and corporate communications, presents the keys to a new Meals on Wheels delivery van to (left to right) SourcePoint Director of Client Services Fara Waugh, Nutrition Program Administrator Karen Pillion, Director of Operations Kimberly Clewell, and Development Officer Julie Zdanowicz. The van replaces a 2005 vehicle that had more than 100,000 miles on it and was plagued by several mechanical issues.